Drop In Consultation Services help guide cities and organizations through virtually every step of the skatepark planning process. Our independent consultants are industry experts that can help to address critical planning procedures like site identification, budgeting and estimates, as well as the creation of skatepark management plans. Expert consultants provide examples, sound data, and guidelines to help craft an individualized template for maintaining a successful skatepark in any type of scenario. Proper planning with reliable studies and guidelines will inevitably save time and valuable resources in the future. Independent and unbiased advice based on research and decades of experience can help create a conceptual design and outline a framework for future skateparks and skateboarding programs. Important factors to consider include goals, design styles and construction materials, as well as user groups and population size. Identifying these factors and creating a priority list are the keys to creating a successful skatepark concept. Once a concept is established and priorities are identified, a city or organization will be properly prepared to engage qualified contractors with their own skatepark needs and priorities well defined and illustrated. Knowing the essential questions to ask when creating skateparks and skateboarding programs can help any organization foster safe and positive environments for skateboarding. Identifying inherent risks beforehand and creating an action plan for risk reduction helps avoid problems as well as deal with the most common issues the most effectively. Drop In resources and expert advice can greatly reduce the inherent risks of skatepark operations for any organization or municipality. 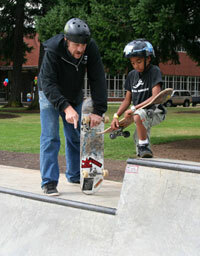 Supervision and staffing needs can vary greatly based on skatepark styles and the goals of a skatepark or program. Different forms of supervision can have both positive and negative consequences depending greatly on management styles. Knowing these factors and following guidelines can greatly improve the process of hiring staff and designing instructional programs. In addition to an in depth knowledge of relevant legal issues, a cultural competency is also needed to fully understand aspiring skateboarder’s needs. These tools can help to develop and nurture the safest and most positive skateboarding environment possible in a variety of different settings. Drop In to Skateboarding curriculum and lesson plans offer an array of safe instructional skateboarding programs for virtually every setting. Curriculum and lessons are flexible and designed for teaching any level of skateboarding skills. Lesson plans can be used for teaching skateboarding safely through physical education programs, public skateparks, camps, private lessons, and advanced skateboarding classes. Lessons are also designed to meet National Standards for Physical Education and Physical Activity Guidelines. In addition to the instructional skateboarding curriculum, Drop In consultants and instructors can provide invaluable resources for professional development and staff training to any organization. A successful maintenance plan is critical to the safety of virtually any skateboarding environment. Because skatepark construction materials, design styles, and usage patterns vary so greatly, so do the maintenance needs. Creating a successful plan and efficient strategy for addressing maintenance issues can help save time and valuable resources in the long run. Even the most successful of skateboarding programs will inevitably encounter an assortment of common issues and dilemmas when dealing with park maintenance, different user groups, and policies. Quite typically these problems and issues may be a common theme in skatepark management and a successful strategy for problem resolution need only be employed. Expert advice and resources help to problem solve minor issues before they become major problems or possibly even fatal flaws. 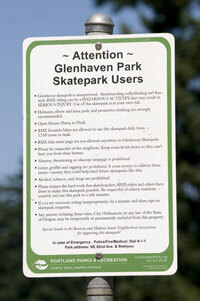 Creating special events can help to promote your skateboarding park or program. Proper planning for demonstrations, competitions, or other events can be critical to fostering a positive atmosphere and skateboarding experience. Identifying resources, acquiring partners, and knowing standard procedures makes event planning a smooth process. Strategies and advice from Drop In experts help your organization to advertise and market successful programs and events. From promoting community programs to planning large-scale competitions, experienced consultants can illustrate the steps to success.